How are your cells doing today? Don’t know? Then a Nutrient Assessment might be in order. Here’s the truth of it: If your body is missing – or even short on – key vitamins and minerals, your cells will not perform at optimal level. This can affect your daily energy, quality of sleep, mental and physical performance at work, school, or sports and can lead to complex health problems. And that’s why a Nutrient Assessment is important. In naturopathic medicine, specialized tests are available to assess nutrient status. These tests are also known as Functional Nutrient Assessment, Nutrient Status Testing, or Micronutrient Testing. Using samples of blood, stool, urine, or hair, these tests evaluate how well your body absorbs and utilizes each nutrient assessed, along with the amount and functional availability of vitamins, mineral, and antioxidants in your cells. They help identify the nutritional supplements needed to achieve and maintain good health and lower your risk for serious illness. A healthy baseline provides a point of comparison for times when you become ill and need to assess what’s going on with your body and what it needs to recover. 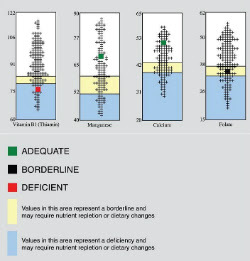 Some nutrient deficiencies or insufficiencies don’t manifest in disease for a long time, even years. Having a baseline and periodic testing can help detect problems early. Ask your La Mesa Naturopathic Doctor about the type of nutrient testing that is most appropriate for you.